From the outside Donelson Cycles in the St. Louis suburb of St. Ann, looks like any of a number of longtime established motorcycle dealerships. You wouldn’t expect that just inside the dealership’s door sits one of the most amazing assembly of historic racing motorcycles to be found in the country. I dare say that there are more pedigreed national championship race bikes per square foot packed into one room of Donelson’s than you’ll find anywhere else in the country. As owner Carl Donelson and his daughter Kim Keen gave me the tour of the museum, it was almost too much to take in. Just past the GP racing leathers and helmet and biography book of Kevin Schwantz that greets you at the door, there sits the Jim Rice BSA Rocket III built by legendary tuner Tom Cates. That very BSA 3 was not only the first multi to win a national flat track race, it was also the same bike Rice infamously crashed through the fence at the Sacramento Mile featured in the movie “On Any Sunday”! I was just starting to let that sink in when Carl then turned me around and pointed out the Yamaha Darryl Hurst rode to victory in the 1975 Houston Astrodome Short Track National, then the Triumph that Gene Romero won San Jose on in ’73, the last time a British bike won an AMA Grand National Mile, Nicky Hayden’s Springfield TT winner! And it just went on like this, bike after historic bike. And some of the racing machines were factory rarities like the Jim McMurren Harley-Davidson Sprint featuring one of only three sand-cast engines ever built by the factory. Or the 1972 BSA A70 Twin, a prototype of which only two were made. Or the Norton Rotary, one of only three known to have made it to America. You get the picture. And it wasn’t just the jaw-dropping motorcycles on display, but the racing leathers worn by the stars of the sport over the years, the hundreds of historic photographs, posters and other assorted memorabilia that hung on the walls. How about Carroll Resweber’s trophy collection or Jimmy Weinert’s racing gear, a signed and worn in competition Ricky Carmichael jersey, or the leathers worn by Freddie Spencer as a novice! A sculpture of Neil Keen made with welding torch and coat hangers. A door of fame signed by hundreds of national-ranked racers over the years. This place is the real deal. A serious motorcycle buff could literally spend hours in the place taking it all in. And that’s not even counting the next room over, which features historic restored and original non-racing machines, including the very first motorcycle sold by Donelson Cycles when it first opened in 1962. Or the last BSA Donelson ever received from the factory before the manufacturer closed its doors. You can tell it was a sentimental motorcycle to Carl. 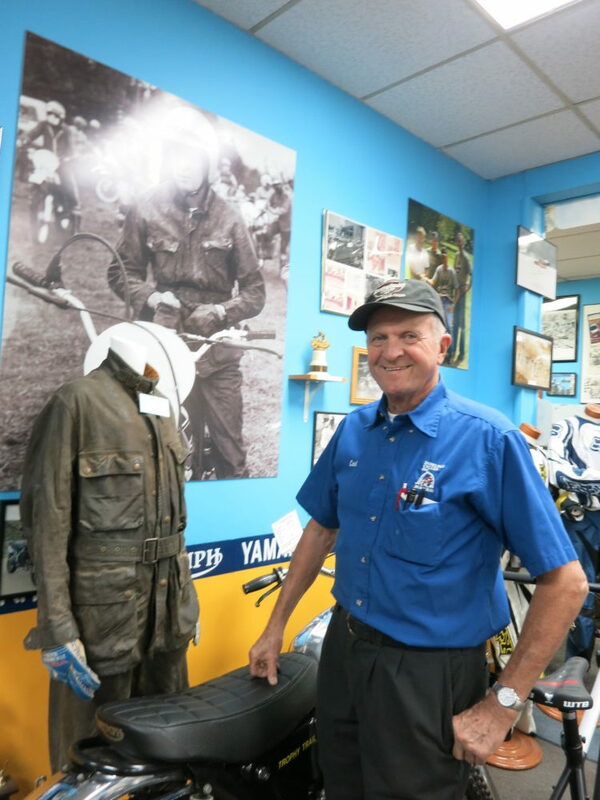 Carl is 82, looks years younger, still runs his dealership and continues his hobby of restoring old motorcycles. His wife Kathy was also working the day I was in the shop. It’s always been a family affair at Donelson’s place. Daughter Kim (wife of the late great Neil Keen) runs the place when mom and dad are gone and a third generation, grandson Stephen Maddox works at the parts counter. All in the family, including the girls, were accomplished racers as well. Carl said it’s hard to remember how the museum portion of the dealership started. “It just happened,” Kim says with a grin. I was lucky enough to also be given a tour of the basement, which features perhaps the largest collection of new old-stock BSA, Triumph and Norton parts in the country. Every winter the shop and museum hosts an annual “Racers’ Reunion”. The reunion began as a birthday party for Neil Keen and has continued as a huge gathering of past motorcycle racers from all across the country. Last year there were 24 previous or current AMA national number riders at the event, including eight Motorcycle Hall of Fame members. This year the gathering is scheduled to take place on February 2, 2019. It’s one of those bucket-list events that every motorcycle racing fan should put on their calendar. Not only will you get to see one of the most stunning museums in the country, but you get to rub elbows with some of the greats who raced these machines.